Yesterday I spent quite a bit of time wandering around downtown Toronto getting in some photography practice (translation: I took a lot of really mediocre pictures) for my class homework, and eventually ended up at the Eaton Centre for a bit of browsing as well. I’m at a point where I’m starting to want to refresh the ol’ wardrobe a bit, but since I do this so rarely I am also perpetually out of practice. 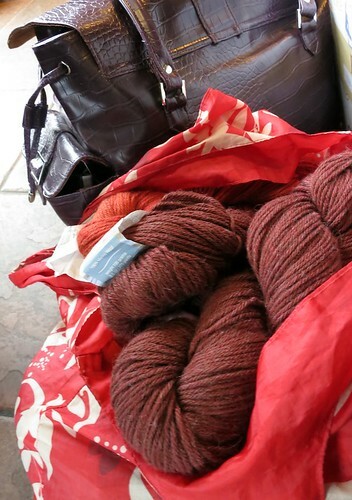 …I have still come to prefer buying yarn as a method of acquiring new clothes. So then I bought a new sweater (some assembly required). Isn’t it stylish? I rather think so. Until then, I’ll go re-read my Tim Gunn tips on clothes shopping and prepare myself for the mall battlefield another day. Happy knitting! That’s the way to do it! The biggest problem for me is finding a shirt or sweater I really like and then discovering the sleeves are 3-4″ too short. That is the only kind of sweater I can bring myself to buy any more. Shopping for clothes means underwear, jeans and tops that will go nicely under hand knit sweaters at this point in my life. “Some assembly required” makes for fun clothes shopping as far as I am concerned! i love the eaton centre. Looks like the perfect jumper to me. Knitting clothing is on my to do list for this year, I hate shopping. ha! Hilarious, shopping for winter knits with a knitter is a very different experience indeed. Very stylish indeed! And I am so glad you get to knit during your photography class. I was just trapped in three days of work meetings and was just desperate for my knitting! I don’t buy clothing at all unless it’s from a thrift store (except underthings and swimsuits, of course). I tailor my finds to fit me and now that I am learning to knit, I have another way to make my own clothing. Hopefully I get good enough that people don’t know unless I tell them! Nice photo! The yarn is pretty can’t wait to see what you make! You found yarn at the Eaton Centre? I love it! I’ve become one of those knitters who tries to shop for clothes and then looks at each item thinking “I could knit that. In a different color. And with a better silhouette” It makes for a very small wardrobe. Amen sister! I hate shopping for clothing. When doing so, I always wish I was shopping for yarn. Much of the clothing is made from synthetic cheap fibers for size 3 teenagers. Being short and on the end of middle age doesn’t help either. Makes me want to get back to sewing which would be another hobby requiring another set of supplies. Although I do have a sewing machine and know how to operate it. Gulp! You’re so right. I hate shopping. Shopping for yarn? Completely different story. But why waste all that time looking for the right thing when you know you can have more fun making the right thing and it’ll be better than something you can buy? This is the best way to acquire new wardrobe items! I often find something I like in a store, take it into the dressing room and take a million photos and gauge measurements! Then I can copy it at home and make it to fit me perfectly:). Can’t wait to see the FO, the yarn is a beautiful colour! One day, I will be able to knit a sweater. I love your version of shopping so much more satisfying anyway. I haven’t been knitting that long (about to sew the sleeves of my first sweater this weekend) but reading a lot of knitting blogs and following the Wovember campaign in the U.K, has really changed my shopping habits. Not that I was ever obsessive, but I did enjoy clothes shopping and seeing the new styles etc. Now I’m always looking at the content label first and losing interest right away when something advertised as “wool” or “wool blend” has only about 10% wool and the rest is all acrylic. It’s much more fun to try and improve my knitting skills and create my own garments. So this year, I’m totally embracing the Slow Wardrobe movement and only buying essential clothes. Which leaves more shopping budget for yarn! On the flip side, your new sweater is lovely. 🙂 Can’t wait to see how it makes up! 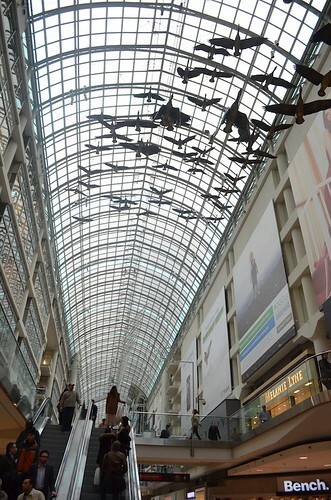 I just absolutely LUV your photograph you posted of the inside of the EatonCentre. Stunning. The geese almost looks real.